Who, a decade ago, would have charged fifty cents to a credit card for a newspaper? Or conceived of using said credit to pay a buddy back for a soda? Credit cards and electronic fund transfers, like writing checks, used to be a thing reserved for large payments. No more – enter: the micropayment. Every aspect of our daily lives is coming to look more and more like the streaming bits and bytes we live by. We believe that any resource we have or want must be available to send or receive with as little delay or fuss as possible. This concept began applying to money with Paypal, now owned by Ebay. Paypal classifies a micropayment as any transaction less than $12 USD and has worked to make this (one of their principal businesses) as simple and painless as possible. Paypal, as easy as it is, is an online business with no instant mobile portal. Micropayments in person were still carried out in cash, until now. Let’s look at an example: Want to pay your buddy $5 for losing a bet? No more going to an ATM to withdraw a $20 bill that you now have to go break on a pack of gum. Just have him whip out his smartphone, plug in Square‘s new…square…and swipe your card to charge yourself – fee free – to your buddy’s account. The implications of these technologies and where they are destined to go is simply astounding. Mark my words: You will be “Bumping” money with your phones along with your contact information, and there will eventually be little limit on transaction amount. 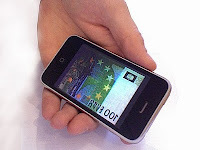 Paper money quickly becomes more and more obsolete, and money transfer, i.e. trade, becomes simpler and easier. I see good and bad in this. Convenience is always a plus, but where money goes, vice will follow. On the lighter side, we don’t need to make it easier to spend money – cash helps you feel the pain of giving it away. And on the darker side, it might be more tempting if all you have to do is bump for bets, drugs, and hookers (and trust me, they will find a way around the paper-trail issue). What are you thoughts? Would you still use paper money? Would you feel secure sending micropayments through phones and Facebook?